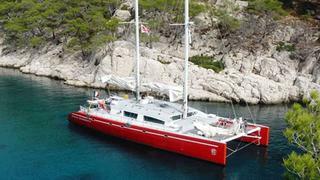 The 24.6 metre sailing catamaran Etoile Magique has had a €100,000 price cut at Bernard Gallay Yacht Brokerage. Custom built in plywood/epoxy by French yard Chantier Etoile Marine to a design by Giddas Plessis & Associates, she was delivered in 2004 with a refit in 2014. The refit included complete checking of all spars, an engine overhaul - with the starboard engine replaced, all hull fittings changed or replaced and new paint for the interior. A popular charter yacht, she accommodates as many as 24 guests in 8 double cabins with Pullman berths, all with en suite shower facilities. Etoile Magique features a large saloon able to entertain up to 40 guests when in port and she comes complete with a home cinema system and satellite televisions. For lovers of the outdoors, her vast cockpit has every facility needed for al fresco entertaining and dining. Under power, twin 115hp diesel engines give her a cruising speed of 8 knots. Lying in St Malo, France, Etoile Magique is now asking €590,000.